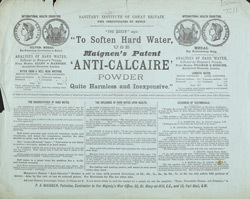 This is an advertisement for Maignen’s Anti Calcaire powder for softening hard water. Water that is hard contains minerals like calcium, magnesium, chalk and lime and the presence of these minerals makes it more difficult to work up a lather with soap so tasks like washing are more difficult. In the 19th century doing the laundry took at least 1 day every week and softer water would make the laborious and backbreaking task much easier. There were other benefits to be gained from having the water softened, ladies with delicate skin could use less soap and thus keep their skin in good condition.